October 31st will soon be upon us. Find all types of Halloween fun this fall. Halloween 2018 Events coming soon – We are actively updating them now! Please check back soon or use the link from last year until we have the new 2018 dates available. There’s a long and murky history behind the day that evolved from Samhain and some religious holidays. As well as some of the traditions such as trick or treating. Check out our section on pumpkins and pumpkin recipes. Find out all you wanted to know about candy corn, classic candy, checking candy for safety concerns and what to do with it when you’ve got too much. Everyone associates Halloween with going to trick or treat. But now it has also become one of the biggest parties for adults of the year. And we’re not just talking bobbing for apples. There are plenty of other Halloween party games to play. Great Halloween music is available. And you’ll definitely enjoy these Halloween recipes. 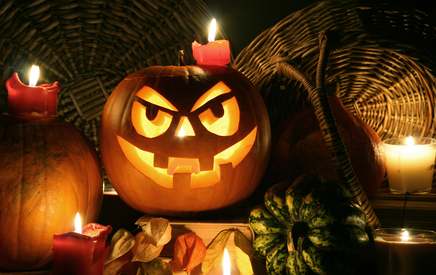 We’ve also found Halloween parties, parades and other events in thirty cities around the United States. See the complete list on the left! Whether you engage in some Halloween travel to a huge party or throw your own, there is no excuse for not dressing up! There are plenty of costumes to choose from here at Funtober. We’ve even got photo tips to help you capture the evening and a book to help you with a ghost tale.